A bay window seat can add some additional seating to the room as well as a touch of elegance that might currently be missing. However, since all bay windows are different, this is a customized addition so your dimensions may or may not match up with any pre-drawn building plans. You can get instructions and help from many different sources, but ultimately it will be up to you to create your bay window seat plans. Bay windows are part of the wall of a home that bows outside of the flat wall of the house. They are normally split between three different windows - two on the diagonal sides of the bay and one on the flat front. However, there are many different variations of bay windows. Some bay windows have six windows, with two on each panel. Some have additional side panels to create more complicated bay shapes. Bay windows are traditionally design elements featured in Tudor, Cape Cod and Victorian style homes but they have become so popular that many architects have started including them in other styles of houses like Ranch and Mediterranean style homes. Bay windows are often sought after because they expand the view of the outside world, which is why they are perfect to use in beach-front homes, homes with terrific gardens or homes with a view of the mountains. 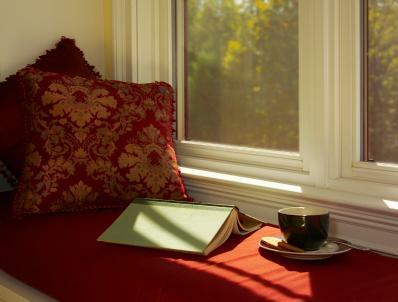 Bay window seats allow homeowners to get the most out of their bay windows and window seat plans can help owners create a little nook of space where they can sit and read or just enjoy the view. When you take the time to create a bay window seat you'll be creating a special spot in your home for relaxation and storage. 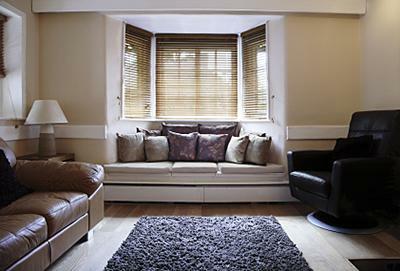 Your bay window seat will need to be customized to fit your existing bay window. You'll need to take accurate measurements of the space where the seat will sit. You'll need to measure the length of the walls and the angles where the walls meet as well. You can find all of these materials at your local hardware or home improvement store. If you want to paint your window seat, you can use plywood, but if you want the natural wood look, oak and cherry are good choices. Before you take any measurements, be sure to remove the trim molding around the base of the wall to ensure accurate readings. Placing a metal putty knife between the wall and the pry bar will help prevent damage to the wall as you pry the trim away. If the trim has been painted over, you can score the top of it using a utility knife to help prevent the paint from peeling away as well. Window seats should be around 21-inches high. This is high enough to provide ample storage inside the seat but low enough so that it is comfortable for the person sitting on it. Use the tape measure and measure 21 inches up from the floor and mark the walls accordingly. Determine how far out you want the seat to extend from the window and take your measurements along the baseboards. You are going to have to measure for the inside width (closest to the window), the outside width (the front of the seat, farthest from the window) and the two sides (the depth of the seat). Use a stud finder to locate the studs in the wall below the windows and mark their locations. Cut the support studs to 21 inches and then install them over the existing studs. Pre-drill the screw holes to help prevent the wood from splitting and use a level to ensure the studs are straight before securing them down. Measure and cut the wood to go along the floor, between each stud and along the bottom front of the seat frame. Secure the wood in place using wood screws or nails. Measure along the front of the frame and install a support stud between the top and bottom 2 x 4s every 12 inches. Measure and cut the 2 x 4s to go along the top of the wall studs. The lengths should measure from the center of the stud to the center of the next stud. Measure and cut the 2 x 4 to span the top front of the window seat. Secure everything in place using wood screws or nails. If using wood screws, make sure you pre-drill the holes to prevent splitting the wood. Measure to find the center of the seat frame and mark it accordingly. Measure the space between the bottom 2 x 4 and the top 2 x 4 and cut a spare piece of 2 x 4 to fit between them. Secure it in place using screws or nails. Do the same thing along the back wall. Measure from the center-point on the top front 2 x 4 to the center-point on the top-back 2 x 4 and then cut a piece of 2 x 4 to that length. Do the same thing for the bottom. Install the two lengths. Measure the height between the top and bottom braces at the front, in the middle and at the back, and cut 2 x 4s to those lengths. Make sure the 2 x 4s are plumb and secure them in place using screws or nails. This will give the center of the seat the support it needs. Take a measurement of the front dimensions and cut a piece of plywood or MDF to those exact dimensions. Apply wood glue to the outer ends of the front and set the front panel in place. Secure the front panel to the studs using nails. Measure out the dimensions of the top and cut a piece of plywood or MDF to the exact measurements. Install a piano hinge along the backside of the seat and then secure the bottom part of the hinge on the inside of the frame. Install spring-loaded lid support hinges along the left and right sides of the inside lid to prevent the lid from slamming shut. Close the seat and it should sit flush with the frame. Paint the window seat and install finishing trim to complete the construction. Purchase or make a padded seat and throw pillows to complete the look of your new window seat. Since window seats must be custom-made, they are a bit more time-consuming and complex than many other home improvement projects. However, the added comfort and unique beauty they provide make them worth the effort.